Paul writes to the Philippian church to encourage them. He shares his personal ambition in hopes they’ll do what he does. He says he pushes himself to reach a goal and to win a prize, an eternal reward. In another place Paul talks about running a race. He runs with intention. 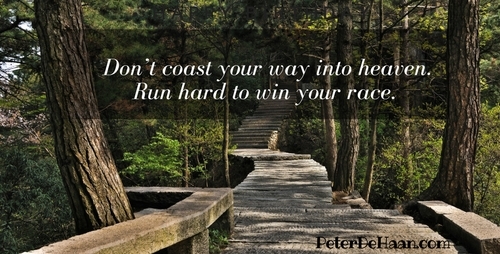 He runs to win (1 Corinthians 9:22-26). So should we. This idea of pressing onward to win a reward is a call to finish strong. We should strive to move forward, to pursue Jesus until the very end of our lives. Though we may retire from work, we should never retire from Jesus. The goal is not to slide into heaven by the smallest of margins but to be ushered in triumphantly because we won our race. Some people decide to follow Jesus and think they’re all set, that they don’t need to do anything more to hold onto him. They assume they’re in and wrongly conclude they can do whatever they want the rest of their life, because as far as eternity is concerned, their actions don’t matter. They think they’re all set. When Jesus calls us to follow him, he calls us to a lifetime of following him. When we follow him, we press on toward a goal to win a prize. We can’t lose sight of that. We must finish strong. We must finish our lives strong, for us and for Jesus.